Your responses to Google reviews can have just as much of an impact as the reviews themselves. Learn how to reply to positive feedback, what to say to unhappy customers, and how to resolve difficult situations. 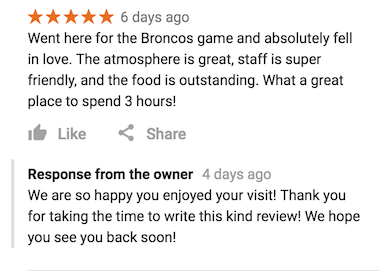 Why Do I Need to Respond to My Google Reviews? Customer reviews can seriously impact your business reputation and customers’ decisions. While you cannot control what other people post online about your business, you can control the impact these reviews have on your business, simply by responding to them. Read on to learn how to respond to reviews on Google, and what to say specifically for positive and negative reviews. PS: Are you looking to get more reviews to begin with? Check out our post on How to Get More Google Reviews, complete with example requests. 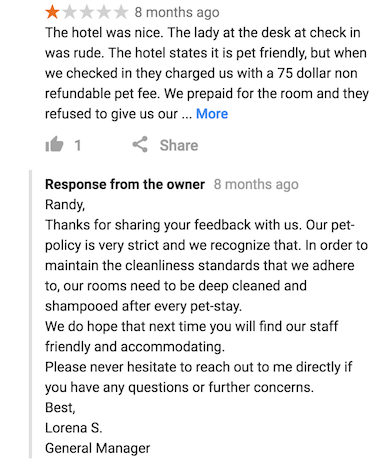 Why Can’t I Respond to My Google Reviews? Anyone can add a place to Google Maps. 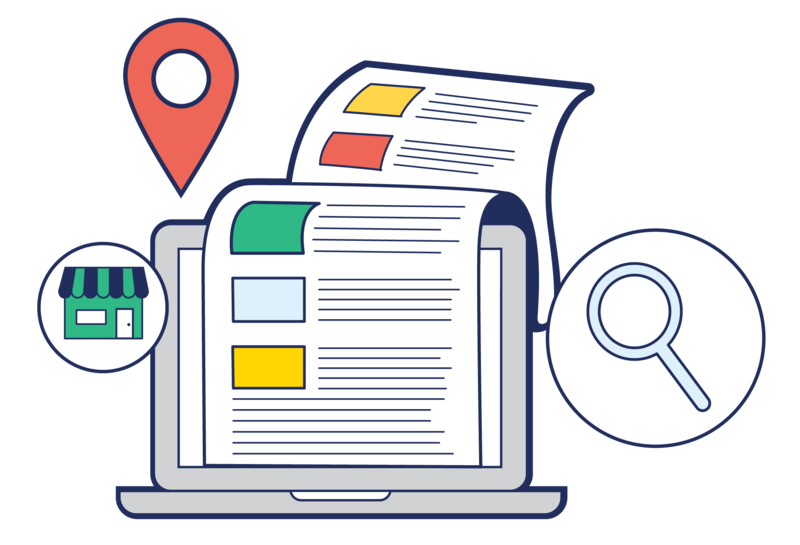 This means your business could be on Google Maps and collecting reviews without you lifting a finger. In order to respond to your Google reviews, you need to claim your listing and verify ownership. 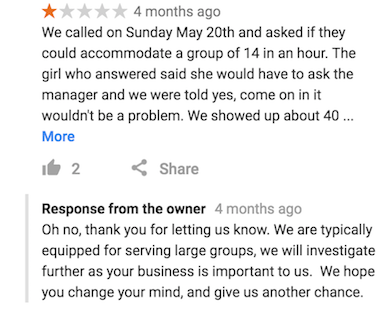 How Exactly Do I Respond to Google Reviews? Before we get into the specifics of positive and negative reviews on Google in particular, let’s go over some general tips to keep in mind. Responding to positive feedback is a way of engaging customers and revealing more about your brand personality to other consumers. While it’s not critical to respond to every positive review, we highly recommend responding to every negative review, which we’ll get into later. 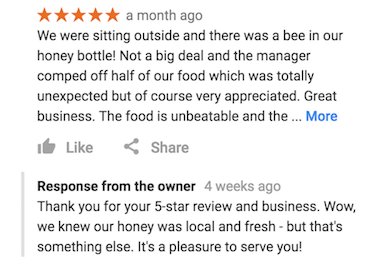 Your responses to reviews are visible on Google Search and Maps. Therefore, your responses don’t just impact the reviewer. When you take the time to reply to a review, you convey the message to other current and potential customers that you are attentive to feedback and committed to customer satisfaction. This can help to build your reputation, earn trust, and encourage more reviews. If your business has a few negative reviews in the mix, don’t sweat it. They show have nothing to hide (and transparency is vital these days), and they make the positive reviews more sincere. Plus, a negative review with a proper response might have more of an impact on a consumer doing online research than a string of generic positive reviews. Negative reviews are learning opportunities, but don’t forget that positive reviews reveal aspects of your business that make you stand out. Customers may even mention things that you might not have noticed yourself or thought to highlight to customers. You can learn about the little things that matter to customers when you pay attention and respond to the positive reviews. Expressing gratitude reaffirms that your business is gracious and welcoming. It also lets readers know that you value and invite customer feedback. Avoid using generic statements. Tailor your response to the specific things called out in each Google review. Consumers want to feel heard, so respond quickly to the feedback. It shows you’re paying attention. It’s best not to respond to every positive review with a long message because that can become repetitive for review readers. Keep it short or respond to some reviews privately every once in a while, as nice and personable gesture to your customers. Make sure customers know you appreciate their positive feedback on Google by responding as much as possible to the positive reviews. It can be tough to stay positive when dealing with an unsatisfied customer. However, the difference between responding humbly with an aim to fix the issue vs. being defensive can either attract or turn away potential customers. Sometimes a bad review can result from a misunderstanding between you and your customer. If there is an answer to their problem, offer any information on your products, services, or experience to clear up the misunderstanding. Describe how you have solved or plan to address any issues described in the review. It offers peace of mind for searching customers. Every customer has their own preferences, expectations, desires, and wishes. In a perfect world, you would satisfy every customer; but in the real world, you can’t; and in the digital world, anyone can publish an online review of your business. You’re passionate about your business and you care about your customers, so negative reviews are going to sting. However, a negative state of mind will only make the situation worse. So take a big step back and a deep breath in. Remind yourself that negative customer reviews are an inevitable part of running a business. Think of them more positively as a challenge to tackle and an opportunity to learn. We’ve all been dissatisfied with a product or service at one point or another. Try to see the issue from the customer’s perspective to determine how to handle the situation. If you were in their situation, what would resolve the problem? By truly catering to what your customer needs most in the situation, you strengthen the integrity of your brand and values. Who is giving the negative feedback? Is it someone from out of town passing through the area and unlikely to use your services again? Is the customer an influencer with a large following of people? Have they been a loyal customer since you’ve been in business? Every customer deserves a good experience, but customers with a stronger influence on potential customers are important to pinpoint. This does not mean finding out who to blame, but finding out where the breakdown occurred. Being able to explain the breakdown shows the customer that you cared enough to look into the issue, and may even get them to see the situation differently. It will also help you to come up with the most effective solution, as well as prevent it from happening again with other customers. Keep in mind that your initial response to negative customer reviews will not likely contain this information. There is a time and a place for providing your findings, which we will cover later on in this post. There will also be times that you can’t find a breakdown on your end. Even still, you should still approach the situation with the same willingness to take responsibility. In addition to an apology and explanation, you may want to offer a discount or a free service to bring the customer back to your business. You might provide a refund, offer the same service free of charge or at a discount, give a gift certificate, or an additional service at no additional cost. Find out from your customer what will make them happy, and serve that need to the best of your ability. Compensatory action in your response to negative customer reviews could mean the difference between simply satisfying your customer and actually retaining them. 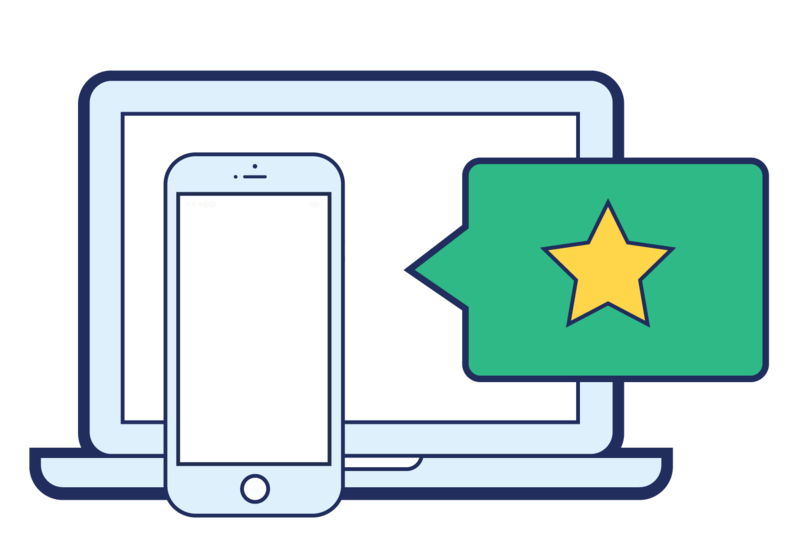 Now that you’ve achieved the right mindset and gathered the important information, you’re ready to actually respond to the negative customer review. Regardless of what went wrong and why, always apologize to your unhappy customer. Your initial message when responding to negative reviews is that you feel sorry that they are in distress, and would like to work with them on changing that. Apologize promptly to show that you care, and concisely (long explanations will come off as defensive). This initial response to negative online reviews should take place on the platform on which it was made. This will help with your online presence and allows you to show both your customer and other visitors to the site that you are prompt and proactive with your customer service. Responding to negative reviews online is particularly challenging, as online communication can easily be misperceived, so make sure your message is clear. After promptly, clearly, and publicly expressing your apologies and willingness to take action, you should then propose to take the conversation offline. Offer to reach out via phone or email for a one-on-one conversation. This enables a deep dive into the situation and eliminates noise such as additional comments by other users. It is also during this more in-depth conversation that you can share your findings about the root of the problem. If a customer is very upset however, the best thing to do is to ask for the customer’s contact information to handle the situation in a private manner. Follow up to make sure the customer is satisfied. Often a bad review can be bolstered by a good follow-up review on outstanding customer service. A negative review with a prompt followup and positive customer reaction may stand out more to a consumer than a string of general positive comments. A proper response can lead customers to edit, remove, or even replace their negative online reviews. Some customers even turn into fans of your business! However, this isn’t always the case. While you cannot delete reviews made on other platforms, you can reduce the review’s prominence. Obtain positive reviews to push the negative review further down the timeline and balance out your ratio. Knowing how to respond to negative reviews, especially those that occur online, is the key to customer relationships and continued success. Negative online reviews are not the worst thing in the world, and when handled properly, can be turned into opportunities to better satisfy your customers and improve your business. • Identify strengths to harness. So claim your Google business listing, monitor your reviews, and respond appropriately!